Announcement *** PLEASE NOTE *** All orders placed between noon on Wednesday, April 17th and Thursday, April 25th will ship on Friday, April 26th, as I am traveling. Thank you! *** PLEASE NOTE *** All orders placed between noon on Wednesday, April 17th and Thursday, April 25th will ship on Friday, April 26th, as I am traveling. Thank you! Love it!!! Better than expected. High quality. Friendly seller. Buying several more for gifts. Thank you!!! Ordered these for my mom. She is so impressed with the quality and craftsmanship. Ordered these for my mom. She is so impressed with the quality and craftsmanship. A very fun bag. So well made. Gave as gifts and the recipient loved it. First of the season farmers' market goodness. Here I am after a morning of berry picking at one of our beautiful, local, u-pick farms! A stack of kitchen towels and a stack of duck cloth just waiting to be turned into marketing bags. Helping you convey fine goods from farm & market to home! Jiggety Pig was born out of a combination of my passions...a dedication to support my local farmers, a love of fine food, and an obsession with interesting and beautiful textiles! Some of my favorite people are farmers, and frequenting the local farmers' market and u-pick farms is a high priority for our family. (Our daughter is an artisan bread vendor at one local market!) Through the farmers' markets and our own kitchen garden, I delight in preserving the harvest and keeping a bustling kitchen. Feeding people well is a great delight of mine! Some of the most beautiful food textiles can be found on kitchen towels. So, from my tiny sewing room in rural New England, Jiggety Pig was born! 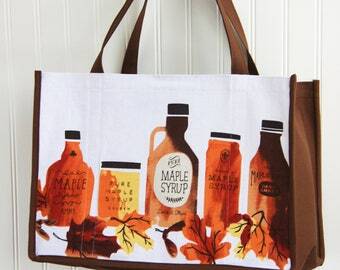 Here, I take fine kitchen towels (most new, some classic vintage) and repurpose them into sturdy and stylish marketing bags. 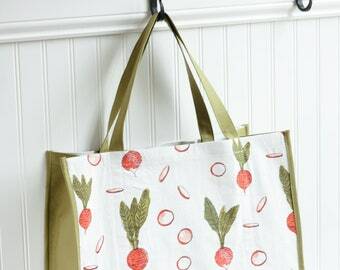 My bags are made to last for years of use, hold a lot in their roomy expanse, are machine washable, and a great eco-friendly alternative to plastic, paper, or flimsy alternatives. Beyond the scissors and thread, here's a bit about me personally. I'm a Christian. I've been married to my best friend for 25+ years. We have three kids, and really cute grandkids. I've spent 17+ years homeschooling. I'm still trying to decide which I like more...tomatoes or dark chocolate. Long, lingering dinner conversations with good friends and a glass of Merlot are one of life's sweetest joys to me. We keep lazy golden retrievers and a rubber chicken as pets. Follow me on Instagram as "goodwifeh", where I post frequent photos of beautiful food. I also make personal purchases as Goodwife. Thank you for shopping at Jiggety Pig! Below you will find my shop's policies. The policies help you to know what I expect from you (like communication and payment), what you can expect from me (like packaging and shipping), and more. Please take a moment to familiarize yourself with my policies. Please note that I do take Sunday as a day of rest, so I return Sunday messages on Monday. -- If you are unhappy with an item, it may be returned for a refund (at your expense) within 7 days. After 7 days, all sales are final. -- Returns only accepted from smoke-free homes and in the condition in which the merchandise was shipped to you. -- All payments are procesed through Paypal OR via direct checkout with your major credit card. -- I ship within 1-3 days of receiving your full payment. -- I ship domestically using Frist Class Mail or USPS Priority Mail. -- Upgrading to Express Mail may be possible. Please contact me for additional shipping cost. -- Shipping and handling charges reflect ALL costs of shipping item(s) to you (box, packaging material, tags, my time, postage, etc.). -- YES! I SHIP INTERNATIONALLY! See shipping prices. --I happily ship gifts to your specified recipient. Please provide me with the name and address of recipient. A gift tag can be included, if you tell me what you'd like it to say. --Occasionally, I may be willing to list an item as "RESERVED FOR _________." Circumstances must warrant such a listing, as per our conversation(s). If so, the "reserve" will be placed for 48 hrs., and then the item relisted for sale to anyone. --If I have a listing marked "RESERVED FOR __________. PLEASE DO NOT PURCHASE IF YOU ARE NOT _____________. THANK YOU. ", and you purchase it anyway, please be advised that you will be refunded for your purchase, and the item(s) will NOT be shipped to you. Taking items intended for someone else is not nice.